Nelly Korda, coming off a red-hot stretch of golf, is poised to become the top-ranked American in the women’s game. When the new Rolex rankings come out, Korda will surpass Lexi Thompson, who currently sits at No. 7. Korda was No. 8. The flip in the rankings comes on the heels of Korda’s near-win at Sunday’s Bank of Hope Founders Cup in Phoenix. After a 68-67-66 start, Korda closed hard with another 66, missing a playoff by the slimmest of margins when her putt at No. 18 lipped out hard.
.@NellyKorda was inches away from forcing a playoff with Jin Young Ko at the @LPGAfounders. Korda's T2 finish is her seventh Top 10 finish her last eight starts, which include two wins. Check out her final round highlights now! Thompson, who didn’t enter the event, has played three times since her win at the CME Group Tour Championship at the end of 2018. Meanwhile, Korda has thrown down the best stretch of her young career. In her last eight events, she has finished in the top 10 seven times, including a third, two seconds and two wins. Her first win came at the Swinging Skirts LPGA Taiwan Championship, and her second came at the ISPS Australian Open. Nelly’s sister Jessica made her first start of the season and nearly won as well. Seven shots back with eight holes to play, Jessica made two eagles and two birdies to tie for the lead. But South Korean Jin Young Ko shot 15-under on the weekend to hold off the Korda sisters, Yu Liu and Carlota Ciganda to claim a one-shot victory. Nelly Korda is poised to become the top-ranked American in the women's game after her latest runner-up finish. 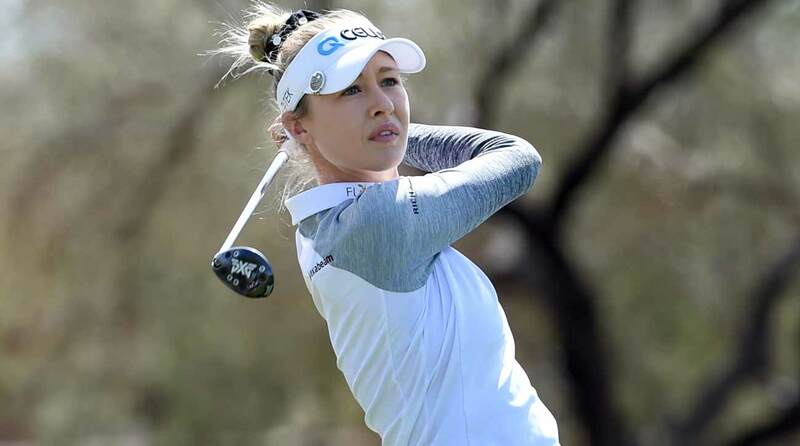 Jessica Korda, 14th in the rankings before her latest runner-up, is looking to get back into the top 10. She is the third-ranked American behind her sister and Thompson.